The 40 metre motor yacht Maestro of Gibraltar, listed for sale by Peter Hurzeler and Jeremy Bottau at Ocean Independence, has been sold with Gibraltar Solutions introducing the buyer. Maestro of Gibraltar was built in GRP by Italian yard Mondo Marine to an in-house design and was delivered in 2009 with RINA classification and had a significant €1.5 million upgrade in 2012, including fitting zero speed stabilisers. An interior by Luca Dini is in neo-classic style and accommodates 10 guests in five cabins plus quarters for seven crew. The master suite is full beam forward on the main deck with a comfortable office while below deck there are two VIP suites and two twin cabins, all with full en suite bathroom facilities. The upper deck hosts the wheelhouse and captain’s cabin and there is a vast saloon with relaxation areas and a formal dining room with decor in marbles, Alcantara ceilings and floorings in Italian walnut and madrona briar wood. Both the main and upper deck have large seating areas and the area directly in front of the wheelhouse features a Jacuzzi and sunbathing area. Twin 1,500hp MTU engines give her a range of 2,600 nautical miles at 11 knots. 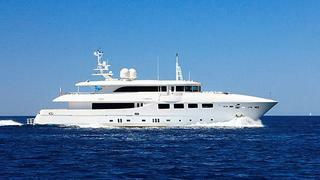 Lying in Athens, Greece, Maestro of Gibraltar was asking €5.9 million.